I am a squatter who passed the bar without going to law school. I did this after transforming my personal struggle with homelessness into an effort to fight displacement in my community. In 1999 my punk band Lesser of Two (lesseroftwo.bandcamp.com) toured Europe. This was a do-it-yourself tour. We had to save up money to pay for tickets and travel expenses. We had to quit our jobs in Oakland, California, which wasn’t uncommon especially given the high turnover in service industry jobs at that time. Additionally, we had to move out of our homes, because we could not afford to pay rent for the seven months we planned to be away. During that tour in Europe I was exposed to European squats. My exposure to the squat scene and the friends I made along the way had a tremendous impact on me, and opened my eyes to organizing possibilities I had never previously considered. The squats in Europe at that time included many large social centers which hosted many concerts where Lesser of Two performed. These squats also provided housing as well as a space for numerous projects such as libraries, cafés, movie theaters, gardens, and schools. Many of the occupations served as part of a community-building and organizing ecosystem. At that time I believed that such a movement was possible only in Europe, and that squatting in the US for political organizing was impossible due to negative attitudes about squatters as well as much more aggressive law enforcement. I returned to Oakland with the intention of returning to my job and renting a room. Before I left Oakland my supervisor had informed me that he would rehire me upon my return. I had also secured a room with some friends which would be available upon my return. Even though our tour was not a financial success I had planned ahead, setting aside sufficient funds for rent. Accordingly, my housing upon my return seemed secure. What I did not realize was that upon my return the dot-com boom would reach a fever pitch, causing wave after wave of evictions. I returned to my work to apply for my old job. Unfortunately my supervisor had left, and the new supervisor wouldn’t rehire me. I subsequently found it surprisingly difficult to find stable work. Despite this I had been frugal enough to set aside sufficient funds to pay my rent and bills. Unfortunately, we were evicted while I was in the midst of a job search, causing me to become houseless for what turned out to be a significant period of time. The timing could not have been much worse. I was unemployed and homeless during a time when rents were rising as dot-com profits soared. Many of my friends were leaving town in search of more stable and affordable housing. The music and art scene I was a part of began fracturing. It was at this point that I decided to try squatting. This decision was based as much on my need for housing as it was my desire to push back against the forces of displacement generally. It was difficult to find people to join me in this effort, but I was able to generate enough interest to identify abandoned properties, research the ownership records, and begin work on properties deemed viable. While I was working on setting up a squat I began residing at a house called Hellarity. This house had been established as part of a “Green Plan” of collective houses designated by the owner to be used to house organizers as well as members of a vegan restaurant collective. The rhetoric for the idea sounded excellent, but it fell apart due to personal dynamics. At Hellarity I became a member of the household collective. The house had an open-door policy, but our collective required consensus (a.k.a. unanimous decision) for inclusion. This duality within the house made it very difficult to resolve problems. To further complicate things the collective was comprised of individuals who came to live together by circumstances rather than by choice. Although the process was technically consensus-based, every other aspect of decision making was haphazard at best. It was at Hellarity that I realized that requiring consensus to reach a decision was not enough to have a functional collective. I learned that collectives had to be formed on a basis of trust, communication, and common goals, which unfortunately our collective often lacked. I endeavored to not repeat the mistakes we made at Hellarity but I found that difficult in the midst of a prolonged housing struggle. In 2004 I was part of a small group that was able to get one of the properties I had previously researched to a state where it was minimally suitable to provide shelter. I moved into that house, which we called Banana House. That same year then-mayor Jerry Brown passed the Nuisance Eviction Ordinance, which made it even easier to evict tenants. Before the ordinance was voted on I appeared with many other Oaklanders to speak out in opposition. It was clear that the city council viewed my friends and me as the “nuisance” they wanted to push out. Soon after I began residing at Banana House the police started arriving to remove me. I did not make it easy for them. Prior to confrontations with law enforcement at Banana House we had begun researching the law. We learned that there was a legal concept called adverse possession. In California adverse possession allows a squatter to acquire title to land if they occupy the land for five years openly and exclusively and pay the taxes. As I continued my research I was surprised to find out just how many rights I had. I began to believe that it could be possible to build a movement here in California similar to what I had seen in Europe. 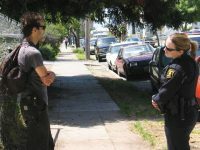 During my time at Banana House a pattern emerged where the police would remove me from the house and issue a citation. I would later return and move back in. I researched the law and would show up in court, which resulted in the initial citations being dismissed. Despite the fact that the first citation was dismissed, the police would return and repeat the process. They did this despite the fact that they had been informed that previous citations had been dismissed and that the District Attorney did not have enough evidence to prosecute. Some of these confrontations were filmed in the documentary Shelter: a Squatumentary. As the campaign to remove me intensified I was proportionally increasing my knowledge of the law. I learned that there couldn’t be a conviction of trespassing without a property owner requesting enforcement beforehand or occupying the property at the time of the entry. I learned that the law states that anyone occupying a property is presumed to be the owner until proven otherwise. I learned that there are a number of ways for a squatter to establish in the public record they are occupying land for the purpose of making a claim of adverse possession later. I learned that a burglary prosecution against a squatter isn’t valid and that “breaking and entering” is not a crime outside of burglary. I also learned that there is no law requiring the courts to follow the laws. Because of that, I was convicted of a crime regardless of my knowledge of the law. It was during this first series of legal battles that I was introduced to David Beauvais, who is an attorney who decided to let me study for the California Bar Exam as an apprentice participating in the Law Office Study Program. My occupation of Banana House finally ended when the police decided to arrest me and put me in jail. In order for me to be released from jail the court issued a stay-away order pending trial. After being released from jail I began sleeping in my van in front Hellarity. After I had left the Hellarity collective they tried to purchase the property by working with a nonprofit in an effort to officially transform it into a housing co-op. The owner refused to sell the property and eventually went bankrupt causing the property to be sold to a speculator who outbid the nonprofit supporting the residents. On the first day that I parked my van in front of Hellarity after my release from jail, I woke up to see one of the house guests on the sidewalk in front with a confused look on his face. He held a piece of paper in his hand. I asked him what it was, and he said, “We’ve been sued.” As he said this he thrust the paper into my hand, and from that point on I began fighting the eviction at Hellarity while at the same time fighting my criminal conviction at Banana House. As these legal battles expanded I spoke to David Beauvais often, and began studying the law under the Law Office Study Program. In California a person can fulfill their legal education requirements to take the State Bar Exam by studying law in a law office for four years under the supervision of an attorney. David agreed to mentor me because I was already studying law for my own litigation. He was also supportive of my housing advocacy and social justice work. Because I shared David’s concerns about social justice, my education would allow me to work on issues that are often overlooked by the legal profession due to economics. Helping poor people is not a lucrative career choice for an attorney. Because of this, many attorneys take better-paying jobs to pay off their student loans. With no student loans, I would be enabled to pursue my passions without the same economic pressures of many new lawyers entering the field today. I ended up representing myself in criminal court because there was confusion regarding my eligibility for representation by the Public Defender’s Office. I had been working part-time at the California League of Conservation Voters, and the income there was sufficient to render my eligibility with the Public Defender’s Office uncertain. I was in a position where I wasn’t poor enough to get a public attorney, but I also was in a position where I lacked sufficient funds to hire an attorney. I asked the judge to appoint counsel, and he refused. Rather than waive my right to a speedy trial I decided to represent myself. That was one of many mistakes I made as I navigated the court system while also studying for the California Bar Exam. While fighting these lawsuits I continued to work on rehabilitating a property that I had discovered. Eventually, this house became minimally habitable, and I have been residing there ever since. I have established all the elements of adverse possession, and I am currently petitioning the court to grant me full ownership rights of the property. I know that I have all the evidence I need to support my case, but I am still nervous because I know that there is no law requiring the judges to follow the law. In 2011 I established the nonprofit Land Action (land-action.org) to use my experiences to help environmental and social justice organizers to access land resources for establishing housing and projects. This experience has allowed me to help urban gardeners prevent evictions and then to begin working with land trusts as well as city and county leaders to establish Land Action’s urban microfarming project, with the goal of establishing 100 farms in five years in Oakland. As I studied the law and prepared for the Bar Exam I realized more and more that the law I was studying and my experiences navigating legal process and applying these laws were extremely different. I had to relearn the law for the exam. The first time I took the Bar Exam I failed. I threw myself back into my studies, and on May 16, 2014 I was informed that I passed the February Bar Exam. Unfortunately, even though I passed the exam and fulfilled all the educational requirements under the Law Office Study Program, my application to practice law was denied. In the letter denying my application it was stated that my trespassing conviction was part of the grounds for determining that I lacked sufficient “positive moral character.” I am hopeful that as I appeal this decision the State Bar will understand that my involvement in housing struggles for the past 15 years will add value to the legal profession. With that in mind I have joined a group establishing the Association of Legal Apprentices (likelincoln.org) to advocate for and support those studying law in the Law Office Study Program as well as those who have completed the program such as myself. By supporting this traditional form of legal education we can remove the economic barrier to the legal profession, thus increasing economic, racial, and social diversity. Also attorneys studying within this program won’t need student loans and thus may choose career paths that benefit under-served and marginalized communities. Steven DeCaprio is the CEO and Founder of Land Action. He is originally from the Florida Gulf Coast and came to Oakland, California to be involved in music and political organizing. For over a decade he has been involved in housing struggles and advocacy in the Bay Area. He is known as an expert on occupying, improving, and repurposing abandoned property for the benefit of the community at large and for providing resources to environmental and social justice organizers. He was featured in the film Shelter: a squatumentary, has been featured in numerous publications, and was named one of 12 Visionaries of 2012 by Utne Reader. ← What if we were Thriving?